The FICM is a common "pattern failure" part on the 6.0L Powerstroke Diesel. Common concerns when failure occurs are no starts, hard starts, and rough engine operation when cold. These symptoms are often accompanied by codes P0611, P1378 and possibly all (8) injector low circuit codes (P0261, P0264, P0267, P0270, P0273, P0276, P0279 & P0282). Our 6.0 FICM's are professionally remanufactured - they completely disassembled, and upgraded components are installed - giving you a "better than new" product in terms of reliability. Each 6.0 Powerstroke FICM is thoroughly tested on a proprietary vehicle simulator to ensure that it will function correctly before shipment. Give your customers peace of mind with a professional grade part from a leading remanufacturer - not another "kitchen table" re-soldered FICM. Our FICM's come pre-programmed - you can plug them in and drive away! If you buy an FICM from the Ford dealer it comes with no software and will not start your vehicle until you have the vehicle towed to the dealer for programming. Ford has updated FICM programming several times over the years to correct various driveability issues affecting the 6.0L engine - our 6.0 Powerstroke FICM replacements come with the latest updated software - specific to your exact vehicle so that there will be no driveability issues or codes caused by incorrect programming. The primary purpose of the 6.0 Powerstroke FICM is to generate the 48 volt signal to operate the engine's fuel injectors. As the FICM starts to fail, this output voltage begins to drop. Before condemning the FICM, it is critical to ensure that it has sufficient supply voltage from the vehicle - low voltage in equals low voltage out! Begin by ensuring that the vehicle's batteries are in good condition and fully charged and that all connections to the batteries are clean and tight. The following information is a summary of the steps necessary for FICM diagnosis - for complete procedures including safety precautions please consult your vehicle's service manual. Disconnect the small wire from the right side battery's positive terminal. This will prevent glow plug operation during the test process for more accurate testing. This will cause codes to set that should be cleared after testing. Find the B parameter on your scan tool's data list - if it is not at least 11.5 volts then you have a battery or connection issue that must be corrected before proceeding. Locate the FICM_MPWR parameter on your scan tool. Cycle the ignition off and immediately back on. During the time that the glow plug light on the dash remains on the FICM_MPWR reading must not fall under 45 volts - if it does, the FICM may require replacement. Verify that your batteries are in good condition (should measure minimum 12.5Volts at rest) and that ALL battery connections are perfectly clean and tight. WARNING: In the following procedure do NOT touch anything under the cover of the FICM - the voltage is hazardous. Access the FICM and remove the cover on the top side that is retained by two T-20 Torx head screws. 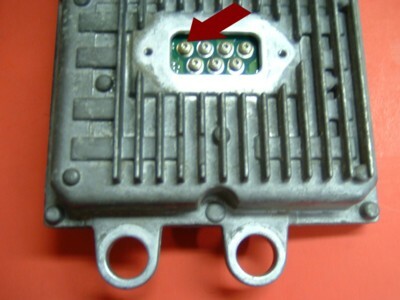 Connect your voltmeter between battery ground and the appropriate screw under the cover of the FICM - see pictures below. DO NOT allow your voltmeter lead to short the screw to the case or you will need a new FICM! Some FICM's use a four screw design and some a seven screw design. Select the appropriate picture below. While staying clear of all engine components have a helper turn the key to the ignition on position. While the glow plug indicator on the dash remains on the measured voltage should remain above 45 volts - if not the FICM may require replacement. Many apparent FICM problems are actually caused by harness issues . Chaffed through harnesses often cause very frustrating intermittent problems. It is critical to inspect the harness in the following areas to prevent repeat concerns or unnecessary module replacement. This is a very easy procedure requiring only basic mechanical skills. Be sure to follow all safety precautions including always wearing safety glasses. Remove the two small hoses from the cooling system degas bottle / reservoir. A small amount of coolant may be lost during this procedure but this loss will be minimal if the hoses and degas bottle are oriented strategically. If you wish to avoid losing any coolant, lower the coolant level slightly before beginning the procedure. Remove the two bolts holding the coolant degas bottle to the vehicle and position the bottle out of the way. On some applications it may be necessary to remove an air duct and or air duct bracket. 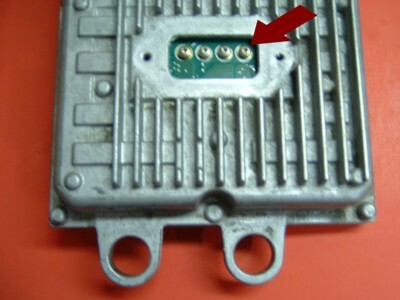 Remove the three electrical connections from the FICM. Be very careful not to damage them. Be sure that both latches on each connector are fully released before pulling on the connector. Remove the four bolts that hold the FICM in place. This item has an additional $150 refundable core charge. While we allow 60 days for a full refund we really appreciate it if you can get your core back to us as quickly as possible so we can help other 6.0L owners get back on the road also. PLEASE pack your core with plenty of padding, especially around the connector. We will accept cores that have been previously repaired as long as they were not damaged in the process. We will not accept cores that are returned disassembled or missing components. Please let us know if you have any questions.